Starting to assemble at the entrance. 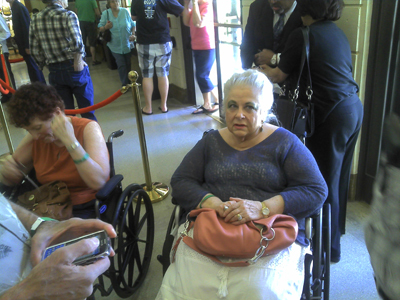 Susan Braun (L) and Rosemary Fugarino (R). 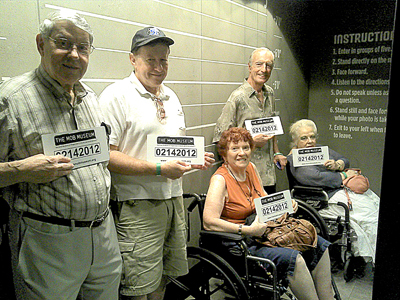 Our CCNY gangsters got in the police lineup. From L-R Don Nitti (the kingpin), Les Braun (infamous webmaster), Susan Braun, Domineck Fugarino and Rosemary Fugarino. Since we all got the same ID number, any rat who fingers one of us fingers all of us. Hey! That ain't legal! Looks like Don and Arlette Ford escaped. 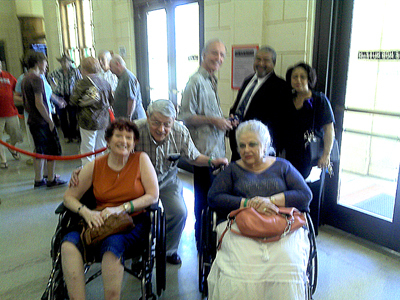 The "CCNY gang" meets at the entrance. Foregroud (L-R) Susan Braun, Don Nitti (the kingpin)) and Rosemary Fugarino. In the back (L-R) are made men, Domineck Fugarino and Don Ford, and money lady, Arlette Ford. and earlier. 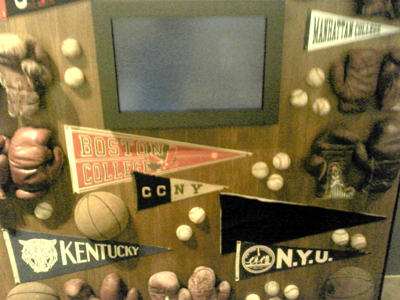 After the scandal, CCNY never again dominated in a major sport.